What a beautiful baby present to give. This baby box comes beautifully wrapped in a white box with coloured tissue paper and ribbon and gift wrap. It also includes a FREE greeting card to celebrate the occasion. We can write a note for you. Included in this baby box is a organic muslin baby wrap that will swaddle the newborn baby or can be used as a pram cover or light blanket. There is also the pink pram pegs which are great to attach the muslin wrap to the pram so stop the wind or sun. 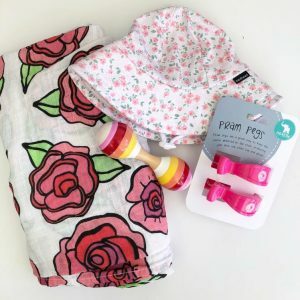 A wooden pink rattle that is easy for the little bubba to hold and a soft baby hat in size 6-12 months so it is a good size for when they go out for a play.